Over the past eleven years, the Helton-Thomas Duo has presented concerts, master classes, workshops, and lectures to diverse audiences in the United States, Canada, Japan, Thailand, China, Colombia, Argentina, Chile, Brazil, England, Greece, and France. Their concerts are always met with tremendous enthusiasm, surprise, and emotion. 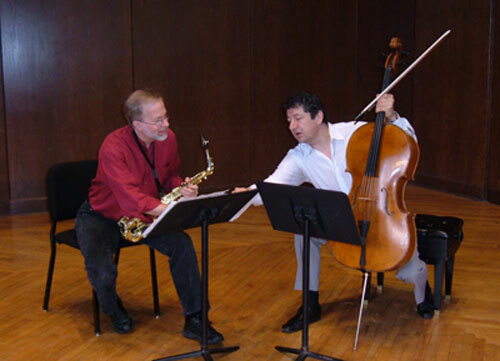 The unexpected combination of the saxophone and the cello creates a unique soundscape that is capable of reaching audiences of all kinds through new, moving, musical experiences. Saxophonist Jonathan Helton is an active solo recitalist and chamber musician appearing in concerts worldwide, including Chicago, Montreal, Vancouver, Beijing, Shanghai, Singapore, Bogota, Buenos Aires, Mendoza, Santiago, London, Paris, Taipei, Washington, DC, and New York. He has been featured on programs of the North American Saxophone Alliance, the World Saxophone Congress, the College Music Society, Wisconsin Composers' Alliance, Chicago Consortium of Composers, and the New Music Chicago Festival. His performances have been heard on North Carolina Public Radio, on WFMT in Chicago, and in national and international radio syndication. He is featured on compact discs from Centaur, Navona, Elf, Innova, Mark Records, and Music from Northwestern. From 1992 to 1999 Dr. Helton served on the faculty at Northwestern University. He is currently on the faculty of the School of Music of the University of Florida where he teaches saxophone and chamber music. Jonathan Helton is a Selmer Artist/Clinician, and a past President of the North American Saxophone Alliance. Cellist Steven Thomas was appointed to the University of Florida's School of Music in 2007, following a 13-year tenure at the Hartt School, where he had chaired both the String and Chamber Music departments. A top prize-winner in the Villa-Lobos (Rio) and Bach (Washington) International Cello Competitions, as well as the Hudson Valley and Charleston Competitions, Dr. Thomas has appeared as soloist with orchestras in North and South America and throughout Europe. As a member of the Cantilena Piano Quartet, he toured and performed in most of the major concert halls of Europe and the U.S. He has performed as recitalist and chamber musician at festivals such as Windsor (England), Gstaad (Switzerland), the Israel Festival (Jerusalem), Prague, Tivoli (Denmark), Itu and Fortaleza (Brazil). As a chamber musician, he has collaborated with such renowned artists as Yehudi Menuhin, Erick Friedman, Donald MacInnes, Jesse Levine, Joseph Robinson, David Shifrin, Peter Frankl, Boris Berman and the Miami String Quartet. Recent years have seen an increase in the literature for saxophone and cello. 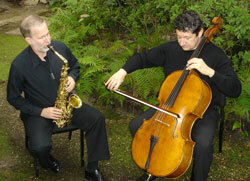 The melodic and expressive capabilities of the saxophone and cello are well-known individually. In the hands of modern masters, these instruments can yield a tremendous palette of colors and a wide variety of musical styles. The saxophone-cello combination results in a chamber music experience of unparalleled power and beauty.